Jointly provided by The Consortium of Multiple Sclerosis Centers (CMSC) and Nurse Practitioner Alternatives (NPA) in collaboration with Catamount Medical Education. This activity is supported by educational grants from Novartis Pharmaceuticals Corporation, Sanofi Genzyme and Mallinckrodt Pharmaceuticals. 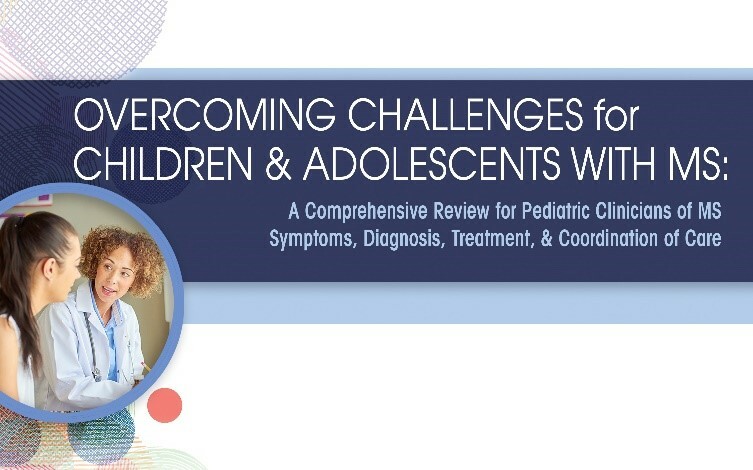 This activity is for pediatric physicians, PAs, nurse practitioners, and other healthcare professionals in the pediatric setting who are involved in the care of patients with MS. This activity has been planned and implemented in accordance with the accreditation requirements and policies of the Accreditation Council for Continuing Medical Education (ACCME) through the joint providership of the Consortium of Multiple Sclerosis Centers (CMSC) and Nurse Practitioner Alternatives (NPA) in collaboration with Catamount Medical Education. The Consortium of Multiple Sclerosis Centers is accredited by the Accreditation Council for Continuing Medical Education (ACCME) to provide continuing medical education for physicians. The CMSC designates this enduring activity for a maximum of 1.5 AMA PRA Category 1 Credit(s)™. Physicians should claim only the credit commensurate with the extent of their participation in the activity. In accordance with the ACCME Standards for Commercial Support, the Consortium of Multiple Sclerosis Centers (CMSC), Nurse Practitioner Alternatives (NPA), and Catamount Medical Education require that individuals in a position to control the content of an educational activity disclose all relevant financial relationships with any commercial interest. CMSC, NPA, and Catamount Medical Education resolve all conflicts of interest to ensure independence, objectivity, balance, and scientific rigor in all their educational programs. Furthermore, CMSC, NPA, and Catamount Medical Education seek to verify that all scientific research referred to, reported, or used in a CME/CE activity conforms to the generally accepted standards of experimental design, data collection, and analysis. CMSC, NPA, and Catamount Medical Education are committed to providing learners with high-quality CME/CE activities that promote improvements in health care and not those of a commercial interest. • The planners, reviewers, editors, staff, or other members at CMSC who control content have declared that they have no relevant financial relationships. • Laurie Scudder, DNP, NP, has served as Nurse Planner for this activity. She has declared that she has no relevant financial relationships. • The planners, reviewers, editors, staff, CME committee, or other members at Catamount Medical Education who control content have declared that they have no relevant financial relationships. (1) There are no fees for participating in and receiving credit for this activity. (2) Review the activity objectives and CME/CE information. (3) Complete the CME/CE activity. (4) Complete the online posttest. A score of at least 66.67% is required to successfully complete this activity. The participant may take the test until successfully passed. (5) Complete the CME/CE evaluation/attestation form, which provides each participant with the opportunity to comment on how participating in the activity will affect their professional practice; the quality of the instructional process; the perception of enhanced professional effectiveness; the perception of commercial bias; and his/her views on future educational needs. (6) Credit documentation/reporting: If you are requesting AMA PRA Category 1 Credit(s)™, nursing credit(s) or a certificate of participation—your CME/CE certificate will be available for download. This activity is best viewed using Internet Explorer 11.0 or higher, Google Chrome 53.0 or higher, Firefox 48.0 or higher. For interactive content, a broadband connection is required. For all CME/CNE activities featuring audio you must have a sound card and speakers. CMSC, NPA, and Catamount Medical Education require CME faculty (speakers) to disclose when products or procedures being discussed are off label, unlabeled, experimental, and/or investigational, and any limitations on the information that is presented, such as data that are preliminary, or that represent ongoing research, interim analyses, and/or unsupported opinion. Faculty in this activity may discuss information about pharmaceutical agents that is outside of US Food and Drug Administration approved labeling. This information is intended solely for continuing medical education and is not intended to promote off-label use of these medications. CMSC, NPA, and Catamount Medical Education do not recommend the use of any agent outside of the labeled indications. If you have questions, contact the Medical Affairs Department of the manufacturer for the most recent prescribing information. CMSC, NPA, and Catamount Medical Education present this information for educational purposes only. The content is provided solely by faculty who have been selected because of recognized expertise in their field. Participants have the professional responsibility to ensure that products are prescribed and used appropriately on the basis of their own clinical judgment and accepted standards of care. CMSC, NPA, and Catamount Medical Education, and the commercial supporters assume no liability for the information herein. For each visitor to this Web site, our Web server automatically recognizes information such as the visitor’s IP address. We do not set any cookies on your computer. Catamount Medical Education, LLC, safeguards against the loss, misuse or alteration of information that we have collected in this activity. If you have questions about this CME activity, please contact Catamount Medical Education at 860-661-4159 or info@catmeded.com.